After Hindi Medium, Irrfan Khan arrives with yet another entertainer. Read the full Qarib Qarib Singlle movie review on BollywoodMDB before making your weekend plans. Two diametrically opposite people meet on a dating app which leads to an exhilaratingly crazy and equally adventurous life-changing trip. It is the story of Jaya (Parvathy) and Yogi (Irrfan Khan), two completely opposite middle-aged people with different dispositions. Jaya is a working professional, while Yogi earns his bread and butter by writing. They meet on an online dating app, and embark on a trip through three cities - Bikaner, Rishikesh and Gangtok - to retrace their past relationships. Both live some crazy moments on the trip. But will love ignite between them while retracing their past relationships? Will they profess their feelings for each other before the trip comes to an end? To know watch the film. Irrfan Khan is a performer par excellence. Whether his films work on the box office or not but, as a performer, he rarely gives you a chance to complain. In Qarib Qarib Singlle, his next release after the critically and commercially successful film Hindi Medium, Irrfan plays a character of his real age, something which makes him look incredibly believable in his part. He adds his effortless charm to the character in a manner that within a few minutes into the film, you fall in love with goofy, carefree and bohemian Yogi. Southern actress Parvathy, who is making her Bollywood debut with the film, is also lovable throughout the film. Barring a few portions, she looks comfortable in her character. The character of Jaya suits her perfectly. Overall, she does leave a mark in her first Bollywood outing. Actresses Neha Dhupia and Isha Sharvani are also seen in cameos. They play their respective parts well, especially Neha succeeds in leaving a mark. Other artists in the supporting cast are good. Known for films like Dushman and Sangharsh, noted filmmaker Tanuja Chandra marks her comeback with Qarib Qarib Singlle, after more than a decade. After watching her latest film, you cannot stop yourself from wondering that what made such a fine storyteller take such a long break from filmmaking. She could have easily entertained us with some brilliant films in between this long gap. But better late than never! Though she has wielded the microphone after many years, her directorial skills are still as sharp as they were decades ago. The only problem that many may find with the film is a not so powerful story. Chandra has made films like Dushman and Sangharsh which had compellingly powerful stories coupled with flawless screenplay. Her latest film scores less marks in those departments. Because of these issues, the film leaves you a little underwhelmed. The desi adventure film travels through three cities - Bikaner, Rishikesh and Gangtok - and cinematographer Eeshit Narain does an amazing job in showing us the breathtaking beauty of all these wonderful cities through his lense. Editing by Chandan Arora should have been tauter, especially in the second half. Vishal Mishra, who can play around 17 instruments effortlessly, has scored music for the film. His first song in the soundtrack, Jaane De, is a very soulful rendition which can be heard on the loop. Singer Atif Aslam makes you fall in love with his melodious voice all over again with this song. Not just the tune and vocals by Atif, lyrics by Raj Shekhar also add charm to the song. The next song, Tu Chale Toh, by Rochak Kohli has been sung beautifully by Papon. The folk-based qawwali Khatam Kahani by Nooran Sisters has the essence of Rajasthani culture in it. It meshes well with the flow of the film. Overall, Qarib Qarib Singlle boasts of a decent album. 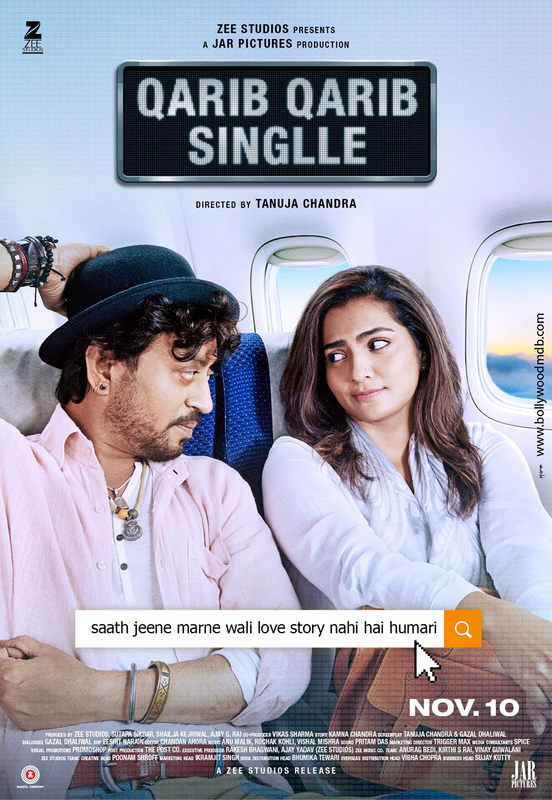 Watch this film for Irrfan Khan and Parvathy’s effortlessly brilliant act. Qarib Qarib Singlle tells a sweet story without any pretentions. It is a film which will appeal to both, masses as well as classes. The edgy trailer of Manoj Bajpayee and Tabu’s ‘Missing’ looks like the perfect psychological-thriller! Toilet: Ek Prem Katha sold for China distributions; to release there later this year!